Before I begin my journey tomorrow I just wanted to tell you a little about myself and the reasons behind why I decided to take part of the Engine 2 28 day Challenge. My name is Charity. I am a 34 year old mother to one very spunky 5 year old boy. In 2011 I was diagnosed with Stage 2 papillary Thyroid cancer. 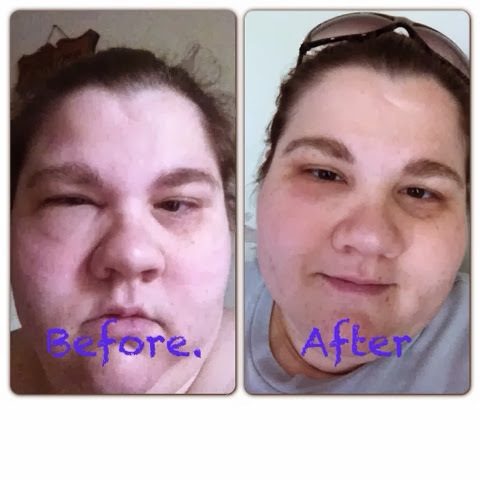 The doctors removed my thyroid and I received I-131 radioactive iodine treatment. I have been in remission since September 2011. Since my treatment my health has backslid tremendously. Every year I have been take off my thyroid replacent medications to undergo full body scans with low doses of Radioactive iodine to ensure no cancer has returned. When I am taken of my medication it is brutal. I gain massive amounts of weight. Last year I gained 50 pounds. The process of putting my back on my meds is a slow gradual process. So, during that time I am lethargic, cold, my body begins to swell, and I am downright miserable. Ewww! Isn't that horrid?? Lol. So glad that's over! Anyway, so far every year I have been put through this process, every year I gain weight and every year I feel a little worse and am always battling some new ailment. A couple weeks ago while I was down with the flu I curled up on the couch with my tissues, DayQuil, and my favorite quilt, turned on Netflix and watched Forks Over Knives. I was blown away! Researching more information about this documentary brought me to learn about Rip Esselstyn and the Engine 2 diet. I was also very excited to learn that in just a few short days they would be starting a national 28 day challenge. I met with my doctor and talked with her about starting a plant based diet and she was totally on board! Saturday I went over to the hospital and had my bloodwork done so I will be able to share with all of you how my health is changing over the next month. In the morning I will be checking in with you all and sharing my general stats, height, weight, and BMI. When my blood work results come back I will share those with you as well. I will also be sharing some of my health hurdles that I am hoping to overcome and take control of. In the next 28 days I will hope to share with you the new foods I will be enjoying, my struggles, and victories... As well as how affordable this new diet can be. Please come back and join me, share in my journey to a new lifestyle! Thank you so much! I am so excited to be on this journey!